Throughout the past several decades, research has proven that being around animals reduces blood pressure, improves mood, and relieves depression. One study in particular discovered people who had suffered heart attacks were more likely to survive a year longer if they owned pets. Another study of Medicare patients showed that those who owned dogs went to the doctor less often than those who did not. In 2006, a study of nursing home residents revealed that those who spent one-on-one time with a visiting dog felt less lonely than if they visited with the dog and their peers. As these studies show, there is certainly no denying the fact that animals have a positive influence on the elderly. 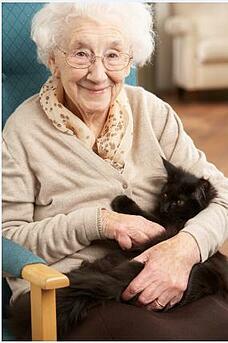 Unfortunately, many seniors in nursing homes or assisted living facilities are unable to own pets. A recent news article highlighted the fact that an increasing number of assisted living communities are adjusting the rules to allow pets, as a result of approximately 40 percent of adult children inquiring about pet-friendly accommodations. Another option for seniors with pets is home care. Living comfortably at home is the desire of 90 percent of the elderly, and home care systems like ClearCare make this option easier than ever before. Reliable home care software not only helps caregivers provide better assistance to the elderly, it can be of great benefit for their pets as well. Whatever the specific needs of the client (and his pet) are, ClearCare’s home care software will alert the caregiver at the beginning of her shift. Families that use home care systems will have the ability to “check in” on their loved one at any time, from anywhere. ClearCare’s home care software is affordable and user-friendly, making it the best value in home care systems today. “There’s something magical that happens with pets,” Tania Prystash, a volunteer manager at VITAS, the nation’s largest hospice provider, says, adding that even patients who refuse to speak will light up with joy and conversation when a dog is brought to visit. If your aging parent is considering different housing options, be sure to ask each home care agency you interview if they offer trustworthy home care software like ClearCare that will help keep them – and their pets – safe and well cared for.